In this lesson you’ll learn how to make a very basic sushi roll. It’s called makizushi. Maki means ‘to wrap or roll’. This refers to wrapping the rice in seaweed (which is called ‘nori’). Now watch this video and read the instructions. Chef Devaux shows you how to roll your first sushi roll in various ways. Maki style and Inside Out. While he’s at it, he also shows how to use a rolling mat. The written instructions tell you step-by-step how to proceed. Any kind of filling for this sushi roll will do. In case you cannot decide, settle for salmon and avocado. A great combination that everyone likes. Don’t worry for now about the best way to cut the salmon or the avocado. We’ll get to that later. Just take a good look at the video and decide for yourself how much to use and how to cut it. Whatever way you choose, the taste will be delicious anyway! And that completes your second lesson at Sushi University. Now start practicing. Cook a pan full of rice – you’ve learned how to do that in the previous lesson -, buy nori sheets to practice with (they are quite cheap) and roll, roll and roll some more. 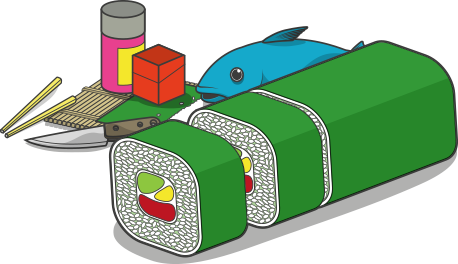 This is an important skill, many kinds of sushi need to be rolled one way or the other. You can make practicing easier by using only one kind of filling. Any kind you like will do. You don’t even need to use fish. For instance, use only cucumber. Cheap to buy, easy to cut. What matters for now is that you roll enough rolls to get the hang of it. Have fun!